Pro Football Hall of Fame Class of 2018 enshrinee Brian Dawkins during the Pro Football Hall of Fame Enshrinement Ceremony at Tom Bensen Stadium. All eyes in Philadelphia are on the Phillies as they close in on free agent outfielder Bryce Harper, and one local legend from another sport is trying to help the team's cause. 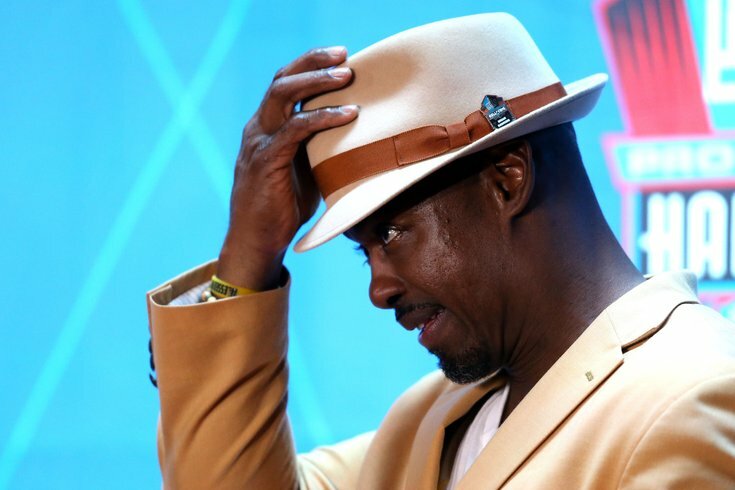 Former Philadelphia Eagles safety and Hall of Famer Brian Dawkins tweeted a message to Harper on Wednesday. He wants him in Phillies red for the long haul. Dawkins recently had a speaking engagement with Phillies prospects, telling the team's young players that Philadelphia is a town that has a unique love for its athletes. "When I say they love you, they love you hard both ways," Dawkins said. "You will have a bunch of passionate individuals that actually love you, that are going to boo you." Ultimately, Dawkins said, that accountability to the fans in Philadelphia is what pushed him to reach a higher level as an athlete. When @BrianDawkins speaks, you listen. Twitter being Twitter, of course there was a hater waiting to pounce on Dawkins' courtship of Harper. One user just had to point out that the Eagles let Dawkins walk after the 2008 season, which ended with a crushing loss to the Arizona cardinals in the NFC Championship Game. There may have been some bad blood at the time, but Dawkins eventually returned to the Eagles in an advisory role and accompanied them during their Super Bowl run in 2017-18. When Dawkins left for Denver, practically every Philadelphia fan was heartbroken the team didn't offer him a competitive contract to keep him a career Eagle. With Manny Machado officially off the market, the Phillies are in a staring contest with their own statements about how aggressive they would be in free agency this offseason. Having a little help from arguably Philadelphia's greatest athlete certainly helps their cause.